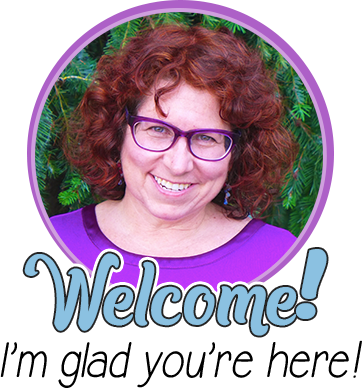 Please welcome Lauren Martin to the blog today! She’s sharing how to use comics to differentiate instruction and reach all learners. She understands the challenge of meeting the needs of all learners and wants to help all teachers effortlessly differentiate every day! Differentiating to meet the needs of struggling learners and Special Education mandates does not need to be time consuming or complicated. 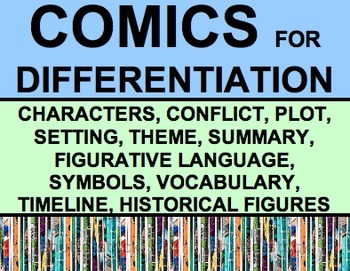 Comics are an effortless differentiation tool to help kinesthetic learners, struggling readers, ESL students, and students with learning disabilities comprehend challenging texts and retain new information in any subject. You do not need to create new differentiation materials for every lesson. Struggling students benefit from consistency and from the ability to conceptualize and display academic content and skills through visual modalities. This is why daily use of comics significantly improves the quality of student comprehension, analysis, and writing. You can use several comic templates again and again to introduce and reinforce any subject, text, topic, or skill. 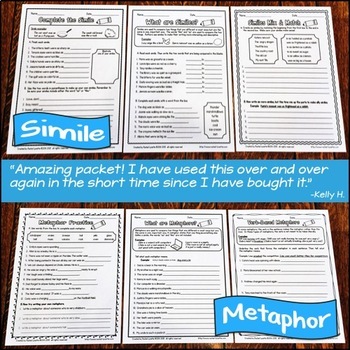 After introducing these comic templates to students just once, you can seamlessly incorporate them into your mini-lesson, guided practice, and independent practice every single day. Effortlessly make comics part of your daily teaching routine, and watch struggling readers and apathetic students enthusiastically retain new content and master new skills. Comics can be used in two major ways. First, students can illustrate comics to show mastery of skills or understanding of content. Second, teachers can illustrate and display comics as a visual aid to introduce new concepts and skills. Use the following comic template ideas again and again for any topic or text in any subject area. 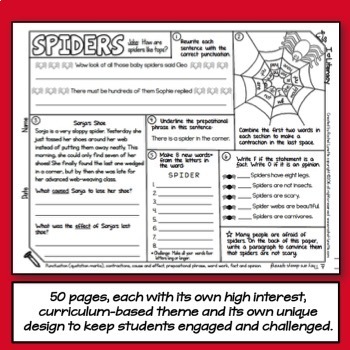 Simply write the assignment at the top of each comic template for no prep differentiation. Teaching imagery, figurative language, setting, or vocabulary? Students need to be able to visualize a “movie in their mind” in order to comprehend a text. Create or download a four-panel comic strip to reinforce content and skills that require visualization. For example, have students draw the setting of a book or the imagery in an important scene. If you want students to identify and analyze personification, simile, or hyperbole, have students illustrate the literal meaning of figurative language in each panel of the comic. Introducing new vocabulary or concepts in any subject area? Have students illustrate the word in a comic strip using images and dialogue bubbles. Finally, if students need to remember or invent a mnemonic acronym, they can illustrate their acronym in comic form to further aid memory retention. Visual modalities are the most powerful tools available to support students with reading disabilities. You can choose to have students write about their comic after the fact, but the act of drawing will significantly improve a struggling reader’s comprehension and memory retention. Instead of taking notes on a worksheet or on lined notebook paper, storyboards and mind maps are a culturally-relevant visual alternative to truly engage all learners in the process of visualizing and retaining challenging information. The simple shift from lined paper to comics will transform the way your apathetic and struggling learners will approach your classroom and your content. Storyboards and mind maps are similar to comics except that each comic panel has a title and a space to write several sentences beneath the image. Unlike four-panel storyboards and comics, mind maps have a web format with a central title radiating out to four panels. Mind maps and storyboards can be used interchangeably depending on your preference. They are the most versatile comic in the classroom and can be used to reinforce almost any skill, content, or text. 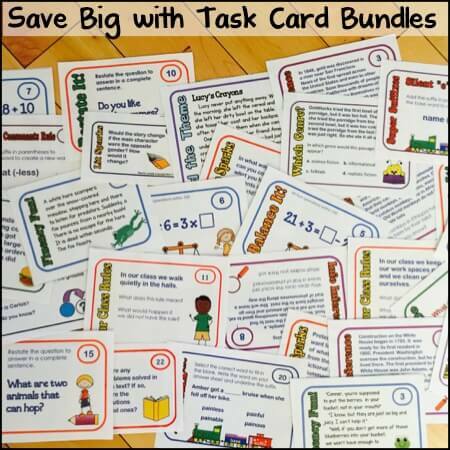 In English use storyboards and mind maps to introduce or apply any Common Core skill. While reading a text, students can illustrate any of the following Common Core skills using a storyboard or mind map: characterization; types of conflict; sequence of events; summary; main idea; setting; imagery; sensory language; figurative language; theme; symbolism; mood; tone; point of view; cause and effect; compare and contrast; and every other English Language Arts standard. When you introduce new vocabulary or concepts, students can illustrate the definition, synonyms, antonyms, and examples in four separate panels. To reinforce any text, students can summarize main ideas or analyze literary elements and devices in a creative storyboard. 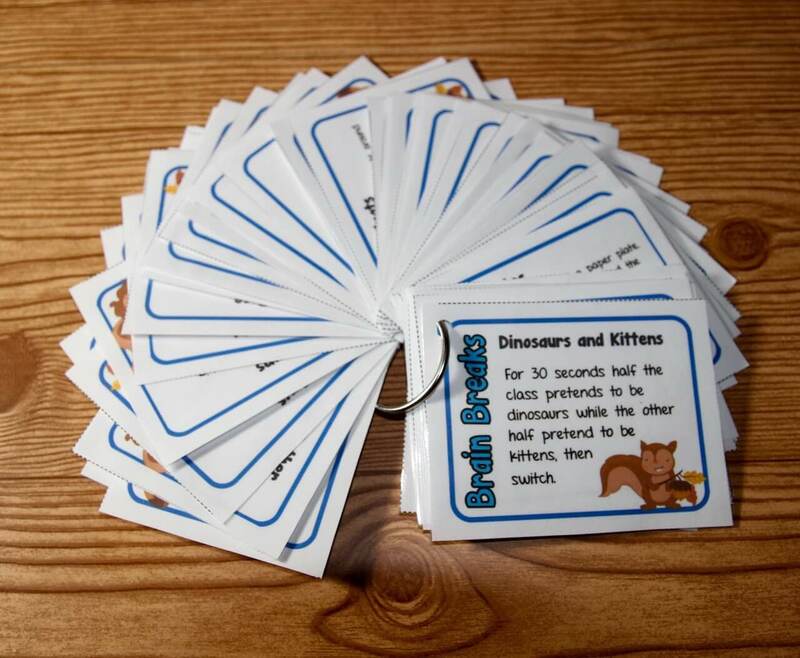 They are perfect for illustrating text evidence. If students need to find two to four examples of theme, characterization, conflict, etc., then they can cite each example in a different panel. Mind maps and storyboards can be used in any subject area. 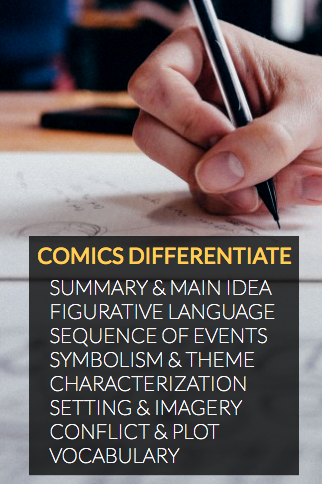 Use comics to brainstorm, to create KW(H)L charts, to define new concepts, to illustrate a mnemonic device, to paraphrase or summarize main ideas in a text book, and to create a classroom reference poster for any topic or concept. The list goes on. If you teach Social Studies, students can illustrate a timeline of events, the causes and effects of the Civil War, the inventions of ancient Egypt, important historical figures of the Civil Rights Movement, main ideas of a primary text, the beliefs of political candidates, and so much more. In Science or Math, students can illustrate the steps in a mathematical equation or in the scientific method. They can draw and describe shapes, angles, mathematical terms, chemical reactions, cell division, photosynthesis, the water cycle, the digestive process, and so on. Go one step further by creating your own comics to introduce new concepts and skills. 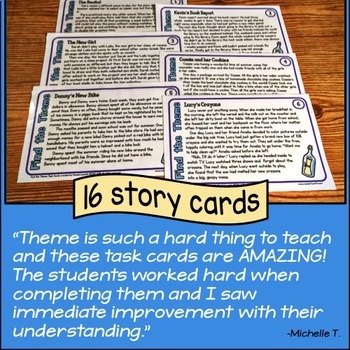 Simply replace or supplement the typical reading response paragraph or essay with storyboards, and enjoy a dramatic improvement in student engagement and writing quality. Plot diagrams are often discussed in English classes but less often put into practice. When you make comics part of your daily teaching routine, you can commit to creating plot diagrams for every single novel and short story discussed in class. Whenever students finish a fictional text, they should always discuss and analyze the exposition, rising action, climax, falling action, and denouement while illustrating a plot diagram. 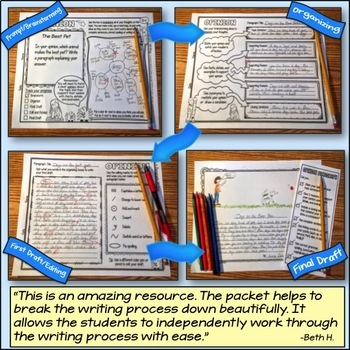 Students can use a printable five-panel storyboard plot diagram or draw their own. Students can label the plot point in the title box, illustrate the scene in the image panel, and analyze why that scene is the climax or other plot point in the description portion of the panel. Plot diagrams are also a powerful tool in the writing process. When students illustrate their creative writing story on a plot diagram instead of simply being told to “brainstorm” their story, they will create more developed, creative, and organized prose. Whether you teach elementary or high school students, the act of illustrating a plot diagram as opposed to simply writing about plot structure will transform the way students comprehend, analyze, and write fiction prose. Finally, never discuss a character or historical figure again using lined paper. Students will love illustrating a character map to share what they learn about a fictional text or a historical account. They will even be eager to learn more. Students should be in the habit of beginning their character map at the start of a text or unit and filling it in as they learn more about the character. A comic character map has one central image of the character surrounded by four non-illustrated panels containing written lists or descriptions below any of the following titles: personality traits; indirect characterization; direct characterization; relationship to others; important quotes; accomplishments; major events; etc. Character maps will vary depending on if you are discussing a fictional character or a historical figure. Teachers can also create their own character map to introduce a historical figure or character in a creative and engaging way. English, Science, Math, Health, and Social Studies teachers can also use character maps to creatively personify any skill or concept and effectively bring their content and classroom to life. You can effortlessly differentiate the content, process, and product of your lesson by simply engaging students in the culturally relevant visual modality of comic-based learning. 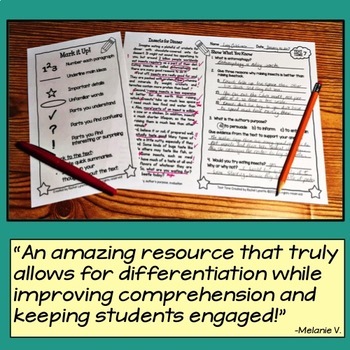 As a Special Education Coordinator, I struggled to help overburdened general education teachers differentiate their lessons and materials. 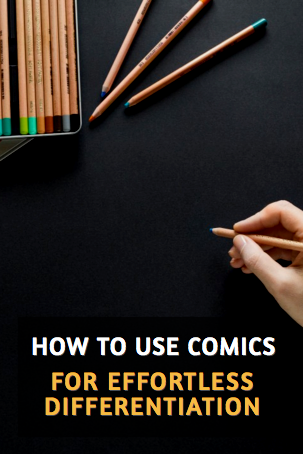 Now that I know the endless opportunities comics provide to effortlessly differentiate instruction, I am excited to help teachers make comics part of their daily routine, with no extra planning required. 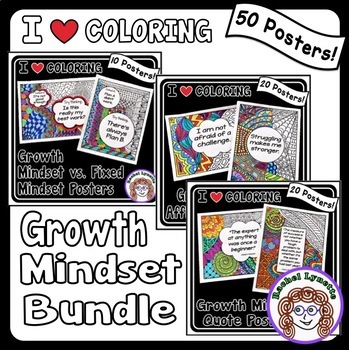 Try my Comics for Differentiation bundle to give yourself, your staff, and your students the tools they need to succeed! 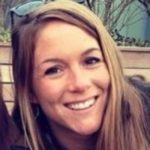 I’m Lauren Martin, and I taught English and History to students with learning disabilities for five years. 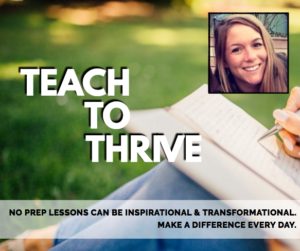 As the teacher-author of Common Core English with Ease, my passion is to create inspirational Common Core activities that empower students to follow their passion, reach their highest potential, and positively impact the world! 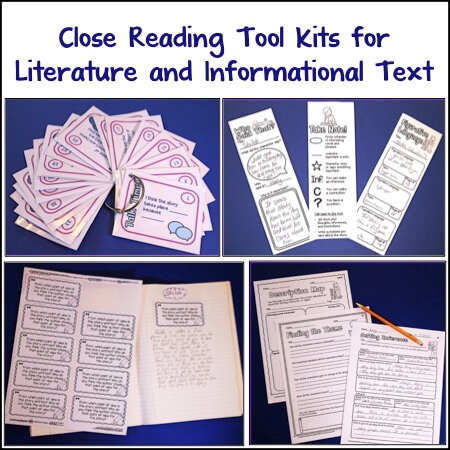 My TpT store has allowed me to share these resources while running the early literacy non-profit Word Rebel, aimed to prevent the preschool word gap and subsequent achievement gap. As a volunteer-run 501(c)(3), we are proud to use 100% of funds to donate books to children living in poverty. 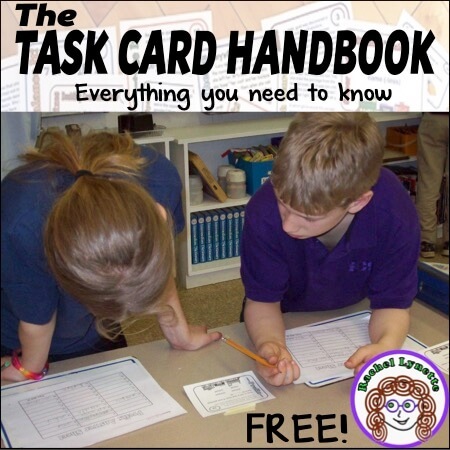 Find free inspirational Common Core ideas and behavior management strategies at my blog, TpT Store, Facebook and Pinterest page. I am interested in this but without a picture example, I am struggling to see it. Can you give me an example of how this looks?